I was talking to an Adult Client last night about his training and I asked him how he was feeling. He said he felt good and didn’t have any more joint pain from working out. His knees no longer hurt when he walked down the steps, he had no more shoulder pain, and his low back stiffness was completely gone. I asked him why he thought he was feeling so good (I knew the answer, but I wanted to see if he realized it.) His answer was the exercises are different than he is used to and they don’t hurt when he is doing them. Not only is he doing the right things, he is doing them the correct way with the right form. Most people are still doing the workouts they did back in high school or college from the 1990’s. They are still trying to lift like they did when they were an 18 year old football player, or a 20 year old college field hockey player. Unfortunately, you can’t look like you did when you were 18, and you sure can’t train like you’re that age. Ditch it. 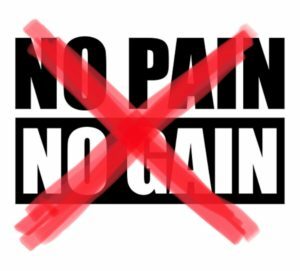 You shouldn’t be in pain when you are training. If you are doing the right exercises, you should feel better when you are doing them. Incline DB Bench: This exercise is joint-friendly because the angle you are pressing at places less stress on your shoulders. This is significantly less stress on your shoulders than dumbbell flat bench and even less so than the traditional barbell bench. Place the bench at approximately a 45 degree angle. You are more than welcome to play with your grip: regular traditional grip (palms facing out) or more of a neutral grip. Landmine Press: This is a great exercise for those who experience shoulder pain when they are pressing overhead. Instead of it being a true vertical pressing motion, it becomes a combination of vertical and horizontal; therefore, taking stress off the shoulder joint. Simply place a barbell in the corner, put some weight on the end, and start pressing. These can be done from a half-kneeling position (on 1 knee) or standing. 1 Arm Dumbbell Row: This is a great exercise to get the upper back stronger along with correcting upper body posture. Most people have shoulders rolled forward from sitting at desks, driving, looking at cellphones, etc. This happens due to tight anterior muscles of the chest and shoulders and weak upper back muscles, allowing everything to be pulled forward. The DB Row will help strengthen the upper back, correcting these issues. An extra tip: This exercise will help your bench go up. The stronger you make your upper back, you will see your bench weight go up. Goblet Squat: Squatting has been considered the “King of All Exercises,” but on the other hand it is known to cause injuries, mainly because it is not performed correctly or too much weight is used. Barbell back squatting can be form intensive and one bad rep of heavy weight can lead to long term ailments. Therefore, for a more joint friendly version, we like the Goblet Squat. This is a better version for beginners and even more so for the aging population. The position of holding a kettlebell or dumbbell in the front loaded position is better because you are not loading the spine in an axial manner as you would with a barbell. The Goblet Squat is going to work the anterior core. Another great aspect of the goblet squat versus traditional squats: goblet squats take out shoulder mobility. If you have poor shoulder mobility and barbell squat you tend to lose posture while performing the movement when reaching back for the bar. Goblet Squats allow you to perfect the squatting pattern. Of course, you’ll need to work on hip mobility and ankle mobility as well. Farmer Carry/Walks: These should be a staple in everyone’s workout. Farmer Carries will work the entire body from a strength perspective, all the way down to grip. This exercise will challenge stability in each and every step. You also cannot beat the simplicity with this exercise. All you have to do is pick up heavy dumbbells and take them for a walk. We like to carry them for about 30-40 yds. One tip I will give is to set them up on a bench, box or elevated somehow so when you need to pick them up you are not bending over to get them off the floor. You can get hurt trying to get these bad boys off the ground. Sled Push/Pull: This is another great exercise which is very friendly to your joints, and there is not a lot to learning the technique. I have to say, I’ve never seen anyone get hurt pushing a sled. Another great characteristic of the sled is you won’t get extremely sore from it. The sled is mainly concentric, the sled being pushed forward in this case, which removes the eccentric portion because there is no muscle lengthening phase. We tend get sore from the eccentric phase of exercise. There is a huge conditioning factor with the sled as well. Simply, throw some weight on a sled and start pushing, of course this is if your gym has one. If not, we do! These are great examples of exercises you can build into your training routines that are joint-friendly and safe and easy. As you can see, you don’t need a ton of equipment, or some expensive machine, just some dumbbells, kettlebells, and a sled. We always like to look at the risk/reward factor when prescribing exercise: is the risk greater than the reward of this particular movement? The answer to this question helps us decide if we use it or not. Good luck with your training and let us know how we can help you!